This guide to the unique theatrical venues of London, from 1567, when the first playhouse was built, to 1642, when Parliament closed them down, sets out the rich dramatic history of this period in relation to the latest exciting archaeological evidence. The book also details the people involved – the builders, actors, playwrights and audiences – what they wore and what they ate, where they drank, where they fought, where they lived and died. There are theatrical quotes and jokes, and illustrations old and new, while a series of walks explores different areas of today’s London, where glimpses of Shakespeare’s London can still be caught. "This is an essential and accessible reference book which can be read from cover to cover for pure enjoyment." "This is a beautifully designed book which successfully binds together a gripping and imaginative narrative with rigorous historical analysis and clear presentation of know facts and articles. …It makes a fascinating read for those already familiar with London’s early modern theatre venues, and those new to the subject." "… Bowsher’s book is a comprehensive survey of the current state of knowledge of the Shakespearean theatre …"
"This is a very accessible, and well-illustrated, account of the subject, and should delight anyone with an interest in theatre." 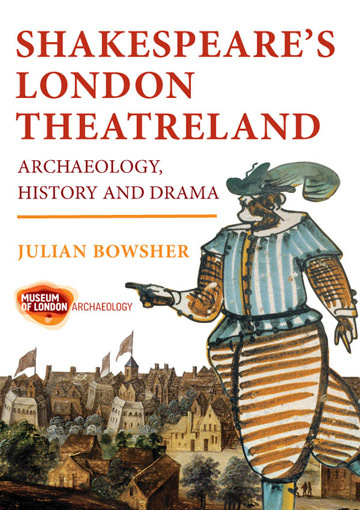 "A new summary of what we know about the archaeology of Shakespeare’s theatres is both due and welcome, and Julian Bowsher, director of the Rose dig in 1989 and joint author of the final excavation report twenty years later, is the person best qualified to write it." "Judging from the engrossed demeanour of those I’ve seen bearing copies in the City, this book is serving its purpose well as a field guide. For anyone not thoroughly au fait with London’s theatrical history, it’s as good a starting point you could find." "Altogether it is a book which anyone interested in Shakespeare, the theatre or English literature needs to own." "Bowsher’s comprehensive topographical and architectural survey, illustrated with a range of images both familiar and new, is aimed at general readers, travellers and museum goers."